[Sky News] Passengers are told to contact their airlines for the latest information after the runway is shut for over an hour to all flights. At least 19 incoming flights were diverted and dozens more delayed following a suspected oil spillage on the runway at London’s Gatwick Airport. No planes were allowed to land or take off from around 10.15am on Monday until the runway reopened just over an hour later. The airport urged passengers to check for an update on individual flights directly with their airlines. An airport spokesman said “Arriving and departing flights recommenced from Gatwick at 11.38am. Details of the spillage, and its cause, were not disclosed, but reports suggested oil had leaked from a jet on landing. [Sky News] A consortium wins the race to land the airport in London’s Docklands and pledges to continue expansion efforts. A consortium including Canadian pension funds and Kuwait’s investment arm is to pay around £2bn for London City Airport. The business was put up for sale last summer by Global Infrastructure Partners – the private equity firm – which paid a third of that sum when it acquired the airport in 2006. In that time, passenger numbers have doubled to 4.3 million in 2015 – an 18% rise on the previous year’s total – but Global’s ambitions for the site in the Docklands area have been largely thwarted. London’s mayor Boris Johnson has sided with campaigners who fear that City’s plans to double passenger traffic by 2030 will mean more noise and pollution. The consortium – made up of the Ontario Teachers, Borealis and Aimco pension funds and Kuwait’s Wren House – said in a statement it was “committed to the responsible, long-term ownership and development of London City Airport to ensure its continued strong position and reputation as a key airport for London”. Read the full story here at Sky News…..
[BBC News] Passengers are facing widespread flight disruption after a computer failure at the UK’s air traffic control centre. Vicky Lane, a passenger on a grounded London to Dublin plane at Gatwick said: “We’ve been stuck on a Ryanair flight… for over an hour. Another passenger, on a flight to Paris, said his plane had “circled around the Lake District for half an hour before turning back to Edinburgh”. Aviation journalist David Learmount said the IT problem would cause “major disruption” but would be resolved by Saturday. “This impacts not just people within the UK, it impacts flights heading here from anywhere – anything heading this way will be told some of them can’t be accepted, and they will have to go back to where they flew from or consider diverting to other countries,” he told the BBC. The RAF – which has its own air traffic control systems – said the UK military was unaffected. According to one travel expert, the compensation bill from the disruption could run into tens of millions. “The airlines will already be racking up the costs,” Independent journalist Simon Calder told BBC News. “Simply refunding passengers’ fares is going to cost them hundreds of thousands of pounds. Read the full story here at BBC News…. [International Airport Review] Heathrow Airport Holdings (HAH) is reported to be planning to sell off Southampton, Glasgow and Aberdeen Airports by the end of the year. The sale would mean that HAH, formerly British Airports Authority (BAA), would be left with just London Heathrow Airport. Reports claim that the sale would be in order to fund further development projects at the world’s third busiest airport. A statement from HAH read: “Over recent months Heathrow Airport Holdings group shareholders and management have been considering their strategic position in relation to our three airports, Aberdeen, Glasgow and Southampton. In addition to London Heathrow, Aberdeen, Glasgow and Southampton, BAA once also owned Gatwick, Stansted and Edinburgh Airports as well, but following a performance inquiry by the Competition Commission (now the Competition and Markets Authority), BAA were ruled to sell Gatwick, Stansted and either Glasgow or Edinburgh Airports in order to break up the monopoly. Following the ruling, Global Infrastructure Partners purchased Gatwick Airport in 2009 and Edinburgh in 2012, and Stansted was purchased by Manchester Airport Group in 2013. Read the original story at International Airport Review…..
[Metro] Heathrow Airport has denied claims four planes in British airspace made ‘mayday’ distress calls as they came close to running out of fuel while battling gale-force winds. Planes that were unable to land at either Gatwick or Heathrow on Friday were diverted to Manchester and met by emergency response teams. It had been reported by the Sunday Times that three of the four planes made distress calls after they thought their reserve fuel was coming to an end. In addition, it was thought that another, an American Airlines flight, had experienced problems with its rudder. However, a spokesperson for Heathrow said this morning: ‘The story in the Sunday Times is untrue. There were no mayday or distress calls received at Heathrow. [Airport informer] If you have to occasionally collect friends and family from Gatwick Airport‘s terminals, from July 1st you need to dig further in your pockets and pay for the privilege ….. and subsidise the taxi industry. Gatwick Airport is planning a major shakeup of the Gatwick meet and greet industry. A recent consultation period has ended hosted held by Gatwick Airport in partnership with West Sussex County Council, Surrey Trading Standards and a number of meet and greet companies operating at the airport, the airport plans to introduce an approved ‘operator scheme’ and has launched a consultation period for meet and greet operators. The aim is to …. Recognise meet and greet operators that meet minimum customer service standards and ensure passengers can identify these operators. The trouble is with these fine principles is that everyone now has to pay more to collect their loved ones as well. Any individual not in the Approved Operator scheme will not be allowed to use the dedicated areas …, and will have to operate from the non-dedicated areas in the Multi-Story Car Park …. paying the regular tariff. Why, well in the words of Julia Gregory, Gatwick Airport’s head of Surface Transport…. There have been changes to the tariff for the short-stay car parks, the key change is that the entry price point is now 0-30 minute at £3.00 rather than 0-15 minutes at £1.50. This change brings us in line with all the other main London airports, and we expect the vast majority of short-stay users to be unaffected (as most people take longer than 15 minutes to use the short-stays). “……this will have most impact from 1st July when the new rules on the forecourt start to be strictly enforced. In particular I expect there to be push-back from customers who today pick-up friends and family on the forecourt in contravention of the signage in place – they will not be allowed to do so from 1st July”. In conclusion, from July 1st, bring some money…. You just know that when an auspicious entity like Gatwick Airport Ltd or a local council extols the virtues of a scheme to improve things……. it’s going to cost you more money somewhere along the line…. [BBT} The new chairman of Gatwick airport, Sir Roy McNulty, has criticised the Gatwick Express train service, saying that it “at times veers towards Third World conditions”. McNulty, speaking to London Evening Standard, aired his concerns that the Gatwick Express service gives incoming passengers a bad first impression due to overcrowding and old rolling stock. “In the short to medium term, our main priority is improvement in the road and rail infrastructure that serves the airport – and above all improvement in the Gatwick Express,” said McNulty. A spokesperson for Southern, which operates the Gatwick Express, said: “In addition to providing a direct airport link, Gatwick Express services now provide around 20,000 extra peak seats between Brighton and London every week to help meet the capacity challenge on that route. 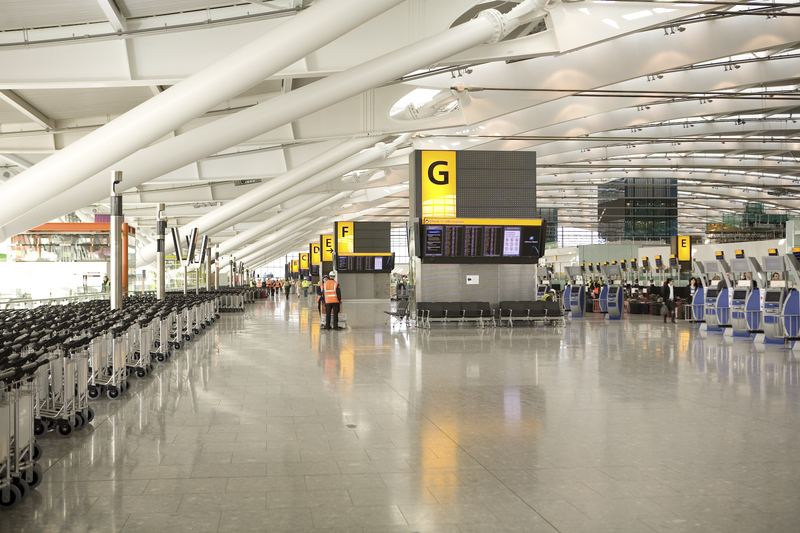 Gatwick last week submitted its response to the Airports Commission, headed by Sir Howard Davies, which is looking at how to expand airport capacity in the south-east. The airport argues in its submission that there needs to be better rail services to London’s airports, in order to attract more airlines. 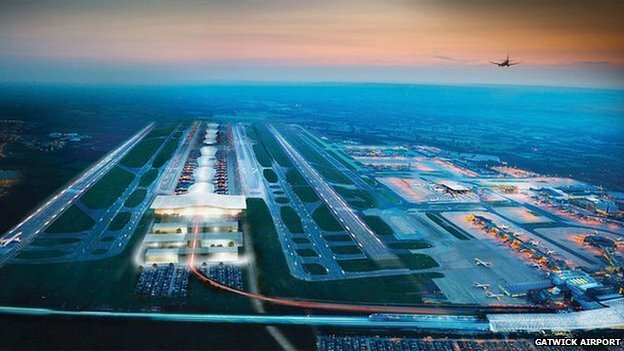 “Although it already has excellent rail links, the airport – as well as some of its airlines – believe more dedicated, high quality and value for money services into London are fundamental to encouraging greater use of its capacity,” said Gatwick in a statement. Read the full story at “Buying Business Travel” [BBT]……. [BCC News] Controlled explosions have been carried out on a van in Gatwick Airport‘s North Terminal car park. Sussex Police said a bomb disposal unit was called after suspicions were raised about a Renault van as it entered the car park at 14:40 BST. Officers were unable to locate the driver or see inside the van. Police said the bomb disposal unit carried out the controlled explosions and there was no suggestion of “any other threats to the airport”. 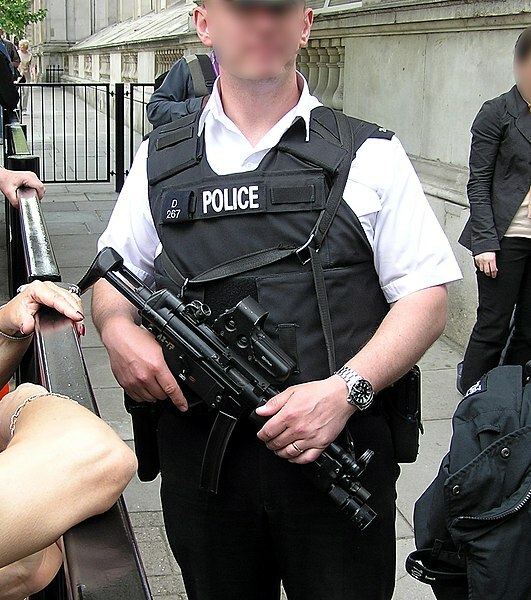 Eyewitnesses reported an increase in armed police at the airport and the presence of a bomb disposal robot. Insp Gary Medland, from Gatwick Police, said: “We are aware that this is likely to cause significant disruption to people arriving or departing North Terminal by car, especially at this time of day. “However, it is important that we establish whether this vehicle poses any threat and the cordon has been put in place for the safety of everyone visiting and working at the airport. They are now looking for two men who entered the car park in the untaxed, uninsured and unregistered van. The men were seen to push up a barrier to gain access to the car park before leaving the van on the ground floor. Gatwick Airport said the incident has not affected any incoming or outgoing flights.